The first time I heard about someone painting a wood floor I was skeptical. Would it last? Could you scrub it? And why would you do it to begin with? Some years later, my wife and I moved into a house with stairs with wooden treads that were worn, stained, gouged and splintered. With not much to lose, we decided to try painting them. To our pleasant surprise, the finish has held up through six years of daily use. The paint also hardened the wood surface, preventing further abrasion. Painting wood stairs and floors requires the same preparation as for any interior paint job. 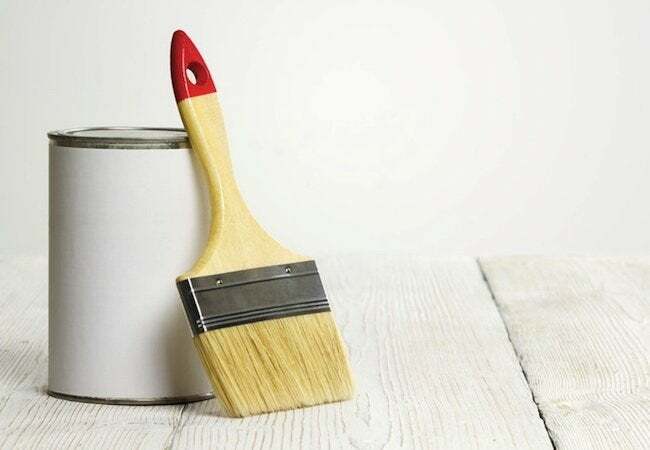 If the surface has been finished previously, such as with stain and polyurethane (or old paint), lightly sand the entire area with 100-grit abrasive paper. For stairs or a single room—120 square feet or less—you may use an orbital palm sander or a portable belt sander. Kneepads help and a dust mask is a must. For large or multiple rooms, consider renting an orbital floor sander from your local home center or tool rental depot. In either case, it’s not necessary to take up the old finish; just lightly abrade it so your paint has something to grab onto. After sanding, sweep and vacuum. I like to remove any remaining fine dust with a slightly damp towel. Shake dust from the towel outdoors as necessary. You may also use tack cloths to pick up any residual dust if you’re worried about raising the wood grain. If there are bare spots (areas where there is no finish due to wear), brush or roll them with primer. This is called spot priming. Don’t worry about getting some primer on previously finished areas. In places where the old coating is secure, it’s as good as primer (as long as it has been lightly sanded). If the floor was never finished (in an attic, for example), apply a coat of primer over the entire surface. You may save yourself from having to apply a second top coat by asking the paint supplier to tint your primer to a tone that matches the top coat. My preferred primer for just about everything is Zinssers’ BIN, an alcohol-based, pigmented shellac primer-sealer (doesn’t stink, dries fast, and sticks to everything), but you should check with the manufacturer of the top-coat paint you’ll be using for its priming recommendations. 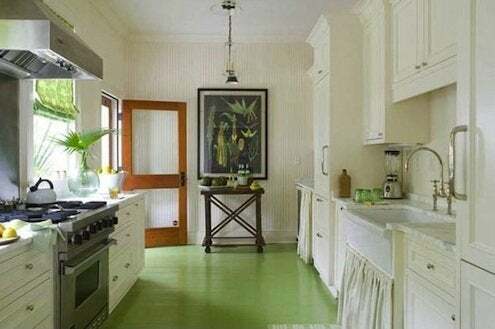 When selecting a top-coat paint, look for a latex enamel that has been formulated for floors, porches, and decks. I’ve had good luck with Sherwin-Williams’ Porch and Floor Enamel. It’s much less expensive than other top-shelf paints; it’s slip-resistant; and it’s versatile enough to be used over wood or concrete, plus it can be tinted to deep colors. Although an alkyd or oil-based enamel might wear better, I’m tired of having to clean up with noxious solvents and having to deal with the disposal of environmentally unfriendly products. In very high-traffic areas, such as doorways, lay down a doormat or small carpet.